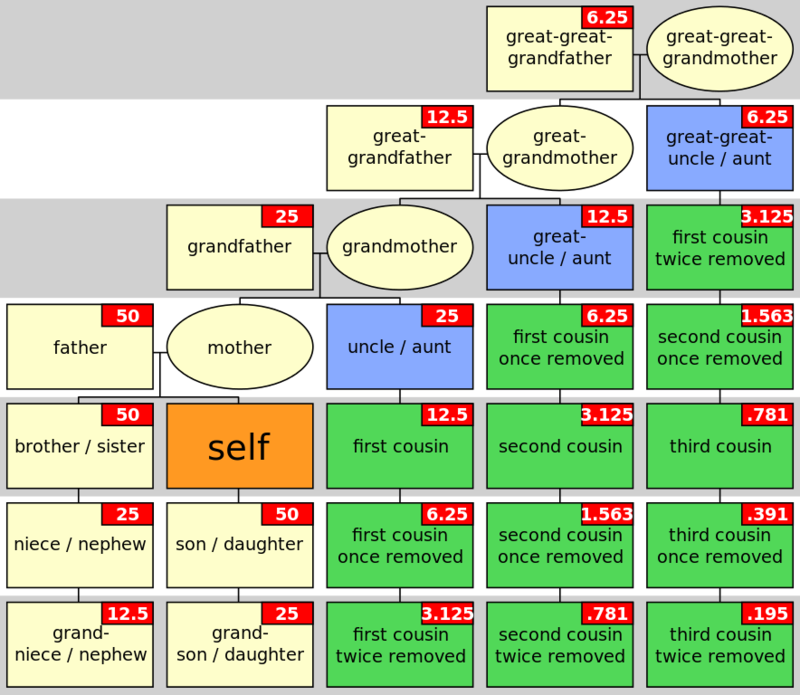 Linking and syncing your family file/database with FamilySearch Family Tree is one of the great features of Ancestral Quest. 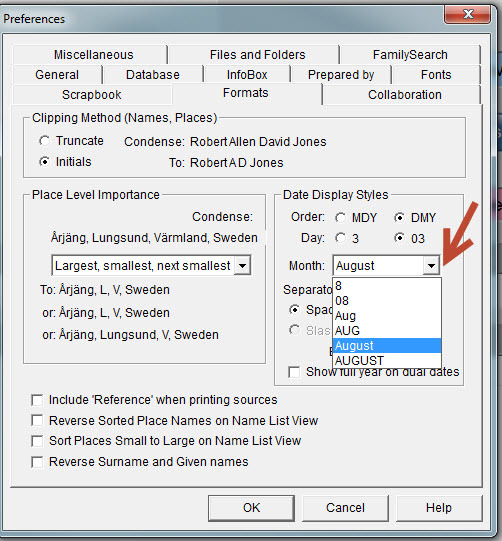 Some time ago, FamilySearch Family Tree went to spelling out the full month and at that time most genealogical software used the shortened abbreviated version of the month including Ancestral Quest. In January when we released our latest build, number 33, the ability to match that change in Family Tree was made available in Ancestral Quest. 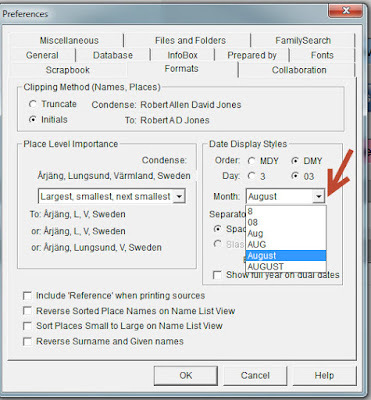 Note the drop down next to "Month", here is where you can choose how you want your month displayed as well as how you want the whole date to appear in your family file/database on all of your reports. This new adjustment makes it easier when linking and syncing with FamilySearch Family Tree but also follows through to the reports making them look more professional. If you haven't updated to the latest build, number 33, you'll need to do that to take advantage of this new feature! 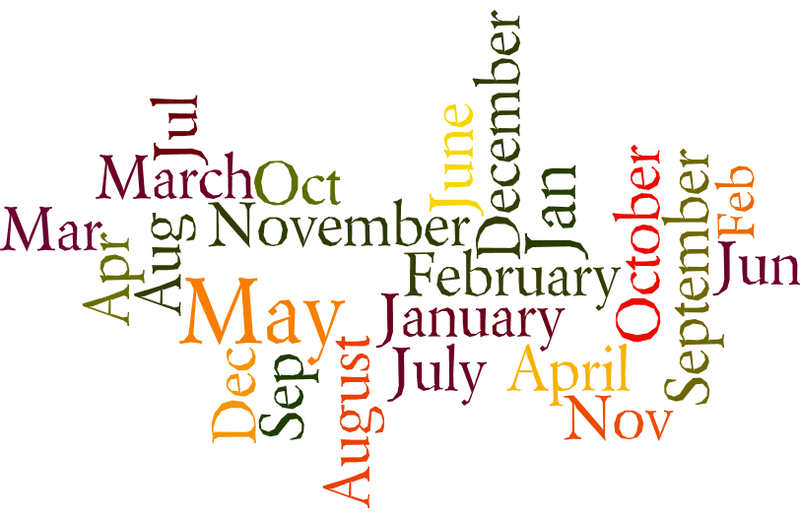 Click here to see how to update your AQ 14 software to the latest build. 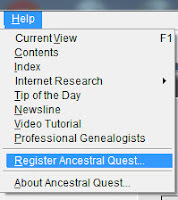 Enjoy this and many other features on Ancestral Quest today, you can try it out for free by downloading Ancestral Quest Basics here. 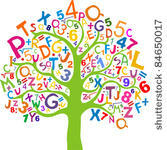 Many individuals download from FamilySearch Family Tree to save them a lot of time doing data entry. With Ancestral Quest this can be done with a few clicks. Its best to add at the end of a line or start with a deceased ancestor. 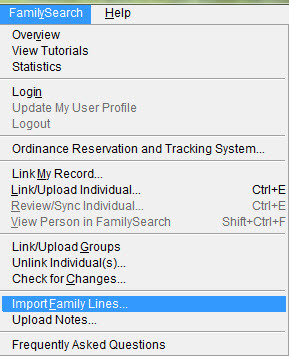 Once you locate them and you have linked them to FamilySearch Family Tree, keeping them highlighted, you'll click FamilySearch in the AQ menu, scroll and click on "Import Family Lines". At this point the program already had "Add Ancestors to the end-of-line person" ready to go with the individual I had highlighted. 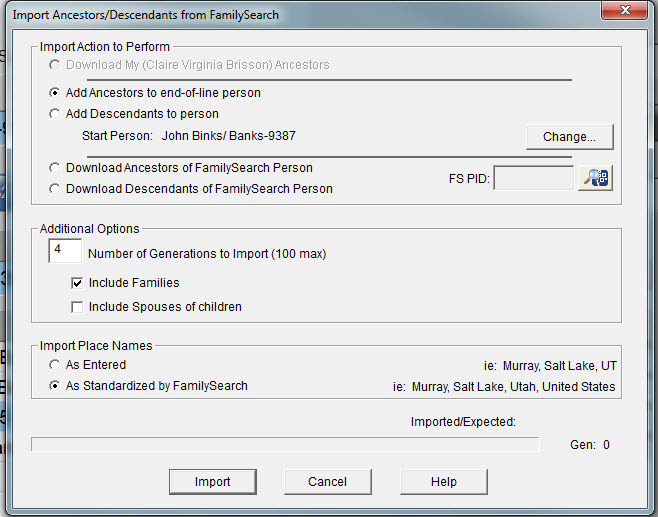 Notice under "Additional Options" that I can state how many generations to download and to include families and spouses of children. You'll need to check those boxes if you want that to happen and be added to your database/family file. At this point I can click on "Import" and I will be prompted to make a backup, one should always make a backup before importing anything from anywhere in case something doesn't work properly. 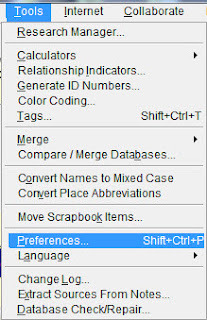 I can also change my selection to any of the other selections, however, you may be asked for their FSPID number so one should write that down if you are doing something different. Once you've passed by the backup, it will start to import and depending on how many generations it has to download will determine the length of time it takes. There is a progress bars that lets you know where its at in the download process but once it is complete those individuals will be added to your database/family file. You may to connect them to the family they need to be connected to. 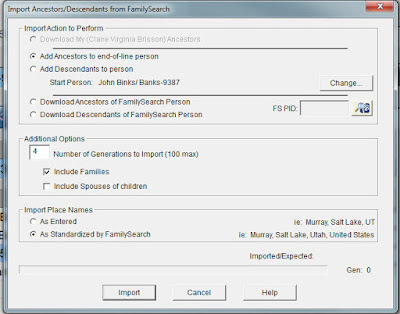 That is it, with a few clicks you can easily update your own database/family file. At some point one is going to need their Ancestral Quest registration key to allow the program to work at full featurered capcity. From losing a computer to a hard disk failure to switching and upgrading to a new operating or adding a new lap top to your digital devices. 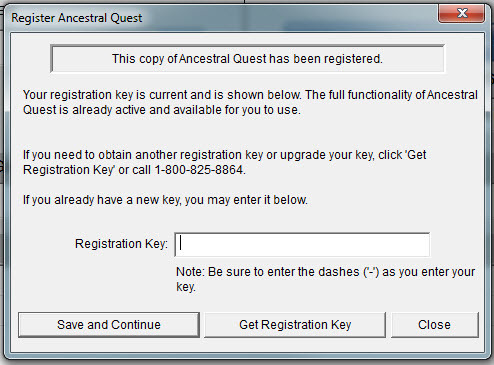 To locate your key, go to Help, scroll and click on "Register Ancestral Quest"
When entereing in the key note that you need to enter it in exactly as it or it will not work. 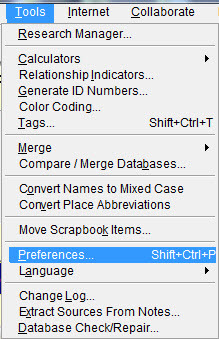 Once entered you'll click "Save and Continue" and you'll be all set to use all the features of the program. If you still unable to recover your key, you can email us at support@ancquest.com and we will send it to you if it is in our database. 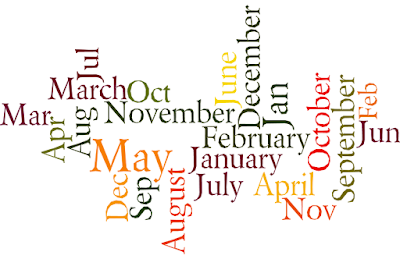 Determining relationships between individuals in your family file can be confusing but is always worth checking out. 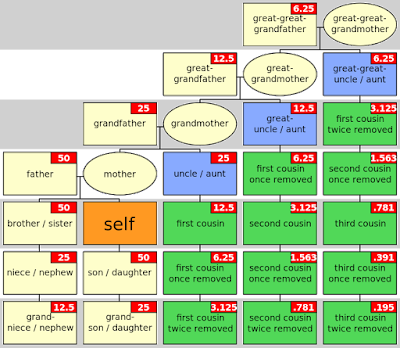 Using Ancestral Quest's relationhip tool this process is made simple. 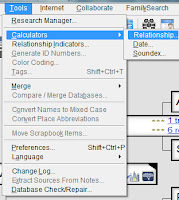 Go to Tools, scroll and click on "Calculators",slide and click on "Relationship". 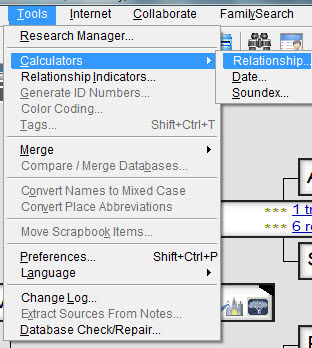 Clicking on "Relationship" brings you to where you check that between two people in your database. Lots of times, opportunities arise where you wonder how 2 particular people are related; at this point it is good to write down their RIN numbers so you can find out. Highlight the first individual in this match and he or she will automatically be in the top section, then clicking on the 2nd "Search button" allows you to enter in the second person and then you click on "Calculate" to learn their relationship. This shows that the relationship between these two is they are "1st Cousins". We'll review how to create a drop line chart to display this nicely in a future blog. 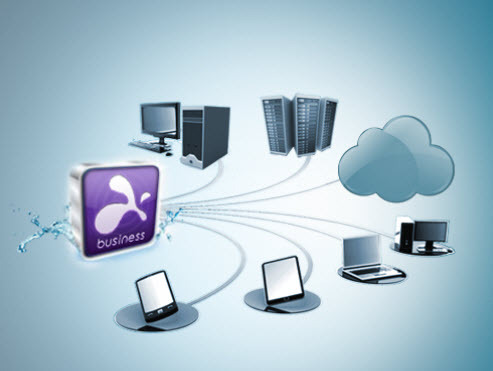 All of us need assistance at some point when using any kind of software product. Some individuals can easily follow directions provided through an email while others need "hands-on" help with whatever the problem is being resolved. Ancestral Quest provides all avenues of support either through email, phone or remote assistance (with your permission) to walk you through any problem that may exist. Sometimes its updating the software, other times its learning how to do a particular function in the software, either way we are here to provide the kind of service needed to match the problem and the situation. Currently Ancestral Quest uses "Splashtop" to handle any remote assistance needs for either a PC or a Mac, email to answer a variety of questions and there are Yahoo Groups set up to get help in the community of Ancestral Quest users. Either way our technical support staff is here to provide you, the customer, with the best customer experience and help possible!